I believe in love at first sight. I’m talking about websites by the way. The first impression you have when you visit a website is really important, at least to me. If I don’t like the way a website looks, I probably don’t visit it frequently. The design is important, but the layout perhaps even more so. If I don’t like it, I might be gone within ten seconds. 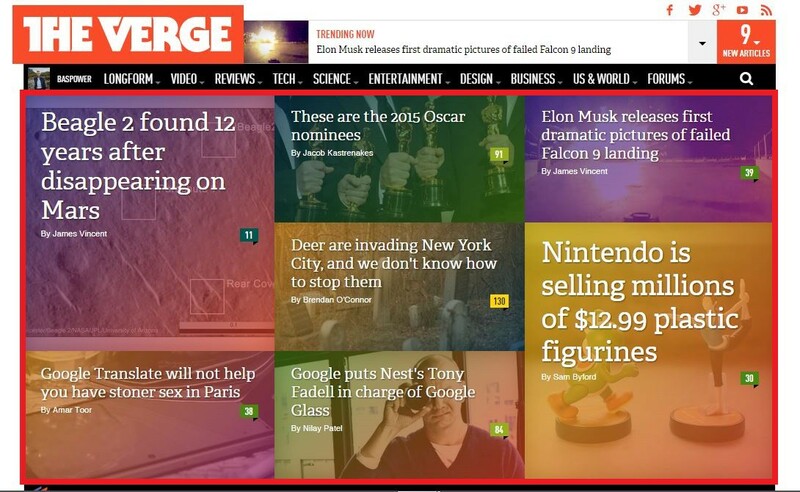 Nowadays, the homepage might be less important than ever, but you still need to have one. After a busy day I’m not scrolling through my Twitter timeline to find articles, but I go to the homepage. 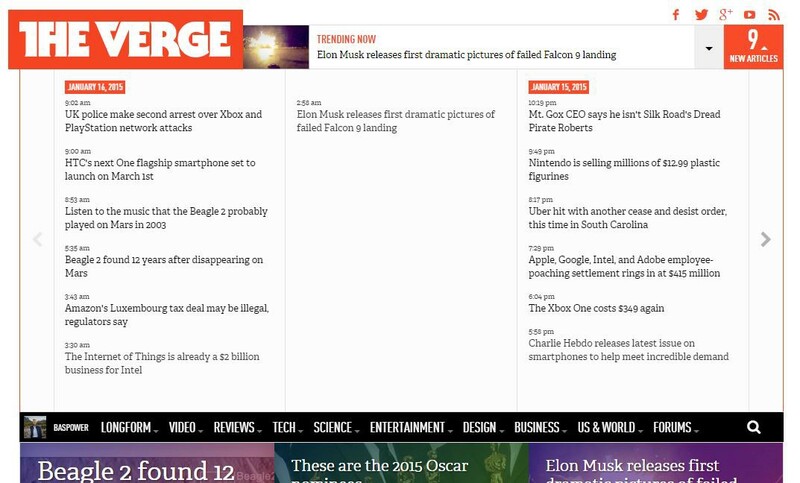 When you visit The Verge, it’s immediately clear where to look. That thing within the red box (which I added) is what I call the “look here!” section. This is obviously the most important thing on the home page and this is where you find the stories that you need to read right now. Why does this work? It’s big, it’s in the center of the screen and it’s colorful. What I like about this is that it’s just headlines. It’s really easy to quickly scan them and decide what I find interesting and not. Most sites have a “latest articles” section, but they often exist out of headlines and a two-sentence summary or the first couple of sentences of that article. The problem I have with that is that it requires a lot more scrolling and is in general harder to go through. The first thing I’m wondering here is: where is the “look here!” section? What are the most important things that I should read right now? The big image might capture your attention, but what is really confusing is that there is no headline. 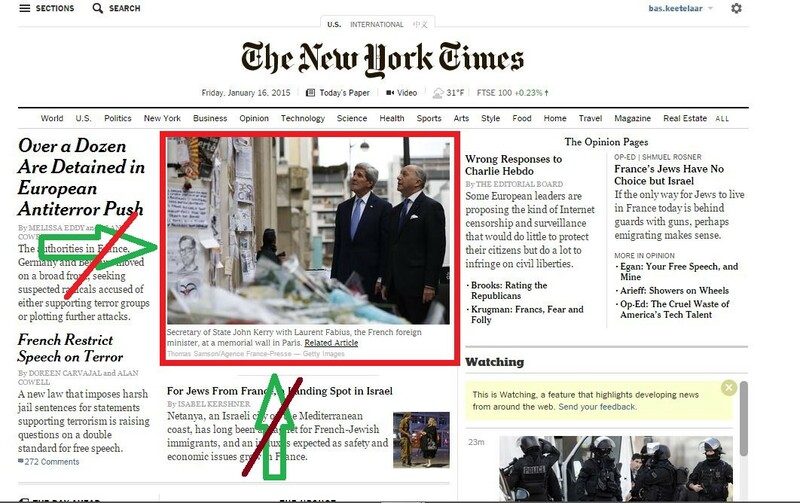 Throughout the rest of the page and even directly under the big image is a headline — summary — image layout. The big image only has a “related article” link, which links to the same article as the image. One might think the headline and summary on the left side are connected to the big image, but that’s not the case. Also, where is the “latest news” section? Are these articles some editorial write-ups? Oh wait, “The Opinion Pages” are on the right, so probably not, but I still don’t know whether it has the latest details or not. These might seem small things, but I think it’s crucial to have a proper “look here!” section, as well as a “latest news” one. Sure, I don’t think sites should solely use chronological order to present articles, but I want to be able to quickly see what’s new, what’s important and what’s not.